Ven para aprender los nombres e historias de las plantas nativas de nuestro desierto en la reserva de Whitewater! A tráves de la narración, podemos encontrar semejanzas de la resilencia entre nuestra comunidad y las plantas. Habrá un enfoque de los usos indígenas de estas plantas. Tendremos el paseo a las 9:30am el 18 de julio; y tendremos otro paseo a las 9:30am y a las 2:30pm el 21 de julio. 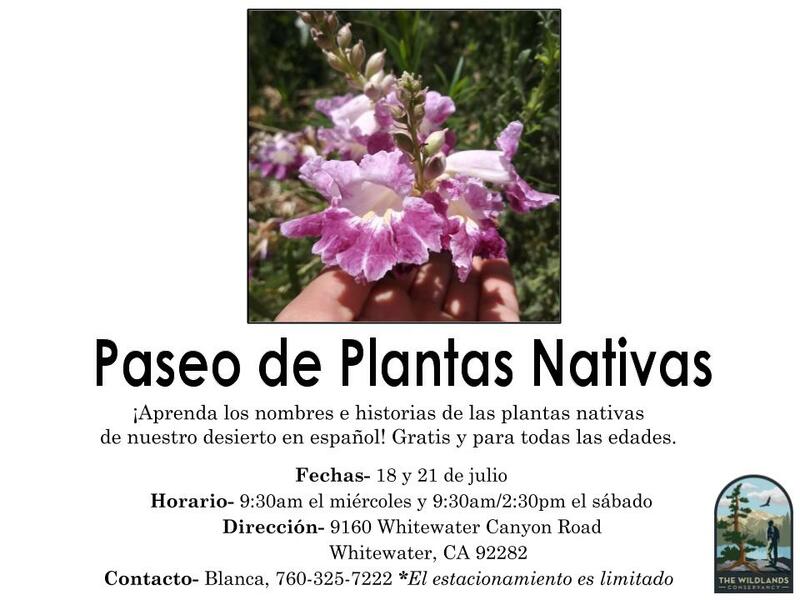 Come learn the names & histories of our native desert plants at Whitewater Preserve! Through storytelling, we can find similarities between the resiliency of our community and the plants. There will be a focus on the indigenous uses of these plants. We will have the walk at 9:30am on the 18th of July; we will have another walk at 9:30am & 2:30pm on July 21st. Questions: For Questions about this event, please contact Blanca Villalobos with The Wildlands Conservancy at 7603257222 or blanca.v@twc-ca.org.